Casting Watanabe Ken as the "Last Samurai" in the Hollywood movie of the same name was the perfect choice, as he had firmly established himself in the 1980s as the ideal actor for such roles. But in fact, the critical acclaim and 2004 Golden Globe and Oscar nominations that he earned in the role came, for many people, as an unexpected pinnacle in a career that seemed doomed just a few years before. A battle with disease that was as life-threatening as any on-screen opponent, followed by a struggle to work his way out of serious debt had many people writing him off as an actor with any real future. But Watanabe is a survivor, and a damned fine actor, to boot. Born in the snowy recesses of Niigata Prefecture, Watanabe came to Tokyo after graduating high school in 1978 looking to be an actor and started studying with the En training studio, which he would belong to for over 20 years. Almost straight away he drew attention in his first starring role in the play Shitaya Mannencho Monogatari, directed by the famous Ninagawa Yukio. His next step was in the TBS drama Michinaru Hanran (Unknown Rebellion) in 1982. His movie debut came in 1984's Setouchi Shonen Yakyudan (MacArthur's Children) about kids learning the meaning of democracy in postwar rural Japan. A handful of other movies came his way in the following years, including Itami Juzo's 1985 classic Tampopo (Dandelion). But Watanabe's reputation was built upon solid acting on the stage and in TV period dramas. His popularity soared during the 1987 NHK "taiga" (weekly period dramas that usually run for a full year) Dokuganryu Masamune (One-eyed Dragon, Masamune), to this day still the most popular taiga ever. Watanabe played the led role of the legendary daimyo (warlord) Date Masamune, easily recognized by his crescent moon helmet decoration, and won over many new fans with his powerful performance. The same year, he received the Ecran d'Or Best New Actor Award from the Japan Film and Television Producers' Society for the film Umi to Dokuyaku (The Sea and Poison). Other major historical works included the classic revenge tale Chushingura and the story of shogun Oda Nobunaga. In 1989, it was on the Calgary, Alberta set of yet another samurai epic, Kadokawa Haruki's Ten to Chi to (Heaven and Earth), that the big blow came to Watanabe's career. He was diagnosed with acute myelogenic leukemia, a life-threatening disease of the bone marrow, that put an end to his part in the movie. Even though he was able to return to acting after just a couple of years, his battle with the disease continued for much longer, with continued monthly visits to the hospital. At the time, he said in an interview, "When filming, I need to put all my physical and mental energy into acting. So I can forget about the fact that I'm sick. To the extent that people ask me 'Are you okay pushing yourself that hard?'" The answer was "No," and in 1994 he had a relapse. But once again, he fought back and was working within a year. Following his comeback, he seems to have appeared in more contemporary productions, such as the 1997 comedy Rajio no Jikan (Welcome Back, Mr. McDonald) and Kizuna (1998), co-starring Yakusho Koji, for which he received a Japanese Academy Award. But while the comeback was well underway, domestically things were starting to catch up on him. He had entrusted his financial management to his wife Yumiko while he focussed wholeheartedly on his career. But at a tearful press conference in late 2001, he revealed that his home (bought for ¥170 million shortly before his illness) had been repossessed by tax authorities and he was heavily in debt. He refused to blame his wife, whom he thanked for her solid support, and vowed to work hard in order to repay his debts. The following year, he quit the En theater group where he had his start and joined the K-Dash agency. He won a second Academy Award for his part in the movie Sennen no Koi, based on the famous historical piece "Tale of Genji," said to have been the world's first novel. He also became the TV commercial face of drink maker Yakult. 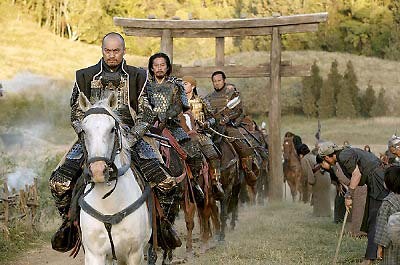 While on the New Zealand set of "The Last Samurai," Watanabe and other staff and crew appeared by satellite hook-up on the 2003 Japanese Academy Awards show. Co-star Sanada Hiroyuki took the Best Actor Award for Tasogare Seibei (which was also nominated for an Oscar for Best Foreign Picture), and Watanabe got one for his supporting role in Hiwa Mata Noboru (The Sun Will Rise Again). In "The Last Samurai," Tom Cruise plays Nathan Algren, a booze-adled Amercan Civil war veteran who comes to Japan to train the Imperial troops to use modern weapons. Algren's troops take on and lose to the country's sole surviving samurai, led by Katsumoto (Watanabe), who soon wins over the American with his warrior's code of honor. Asked about his experience in the Hollywood epic, he said, "Of course I felt the scale of Hollywood always because the set is amazing. Me and Algren work a lot in the snow temple. No dialogue, it's only montage, very short cuts and the big set we made is so amazing." On the subject of sword fights, "It's a difficult thing because Katsumoto carries two swords. Very different style, and the footwork is so very different. Very difficult choreography." Along with Sanada and Yakusho, Watanabe is one of Japan's most versatile and talented actors. He was the first Japanese actor to be nominated for an Oscar in 37 years, and he promised his fans that he would be back again. Shortly afterwards, a plum role as a villian in "Batman Begins" was announced, he moved to Hollywood and signed with the US agency Endeavor. This undoubted high in his life was sadly marred by his divorce. But with hopefully his hardest trials behind him, he continued to build on his well-earned reputation. He landed the plum role of The Chairman in the Hollywood adaptation of "Memoirs of a Geisha" (released as "Sayuri" in Japan). The movie opened in December 2005 and it was on the day of the New York opening that he and actress Minami Kaho, also a divorcee, announced their recent marriage.